An Enduro racer from a stable with pedigree, the Sommet is built to elevate your downhill riding. Lightweight and responsive this race-ready steed has the tech and spec to achieve PBs and podiums with regularity. Shaped with modern Enduro-centric geometry, the Sommet VR Mountain Bike is the ideal steed for tackling technical descents. The stiff and responsive build benefits from a phenomenal suspension system made up of a 170mm front travel RockShox fork and rear shock that pivots on a sealed upper bearing, as well as a SRAM NX Eagle 1x12 drivetrain and SRAM Guide RE hydraulic disc brakes. Rolling on wide WTB rims and Maxxis 3C tyres, it powers through every trail and terrain with ease on your way to the finish line. Also featuring Boost tubeless ready wheels, clearance for up to 2.6" wide tyres, and ISCG 05 chainguide mounts, this ride is an adventurous and dependable Enduro racer from top to bottom. Vitus Sommet VR Mountain Bike (NX Eagle- 2019) is rated 4.0 out of 5 by 2. 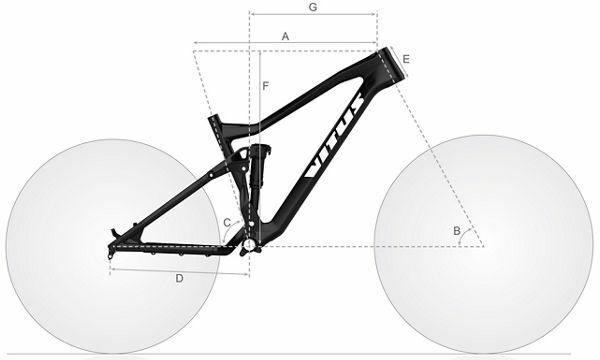 Rated 5 out of 5 by Tutonator from Can it be true... ... an Enduro bike with no major compromise. There seems a trend to go with smaller forks in some new ranges of bike for 2019 and had been told that most people do not use or need longer suspension for our use or technical ability. I do somewhat agree and the bikes are naturally lighter with smaller forks and shocks but I’m pleased that I went against this trend. It is heavier but it has to be to enable it to be capable of enduro style riding. The rear shock doesn’t have any pre set features such as lock out, climb and full sus modes, which did worry me about technical climbs. I didn’t need worry as the bike geometry takes care of this! I have to say that the bike wasn’t ready to ride. The dropper post was slightly activated via it’s cable; it simple wouldn’t stay down. Slight adjustment by myself soon fixed this (although there wasn’t much cable to play with and it was frayed with no end cap, so I may need to replace the cable). The brakes should be good but they feel very spongey, and suspect some air is in the system as they seem pretty poor. I do think it can only be pads and poor setup as I’ve had far cheaper single pot systems that work better! Very impressed with the rubber rear chain guards on the seat and chain stay! No end caps on the handle bars and is only rubber and expected some end stop. The NX group set feels just as plush as the Eagle range and very impressed. More than enough gears too. What would make the bike better is internal cable routing on the down tube. Seems such a simple thing. So, the dropper post has a hole engineering in the frame under the bottom frame guard. Why no place that hole higher up and no have that cable run under the down tube? Why not put all the cables in the frame? Perhaps, without internal routing the cables move and slap around inside. Very impressed with the fork and rear shock DebonAir system reducing break-away force, as the bike tracks the ground really well. Love the bike and think the price cannot be beaten, not sure how they achieve it.